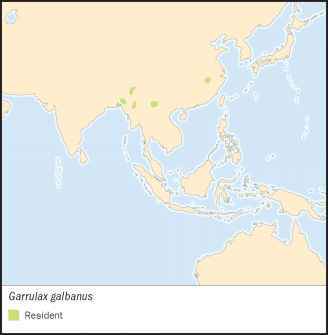 Garrulax galbanus Godwin-Austin, 1874, Manipur. Three subspecies. Chinese populations may constitute separate species. English: Yellow-bellied laughing thrush; French: Garrulaxe a gorge jaune; German: Gelbbauchhaherling. 9.1 in (23 cm); 1.75 oz (50 g). 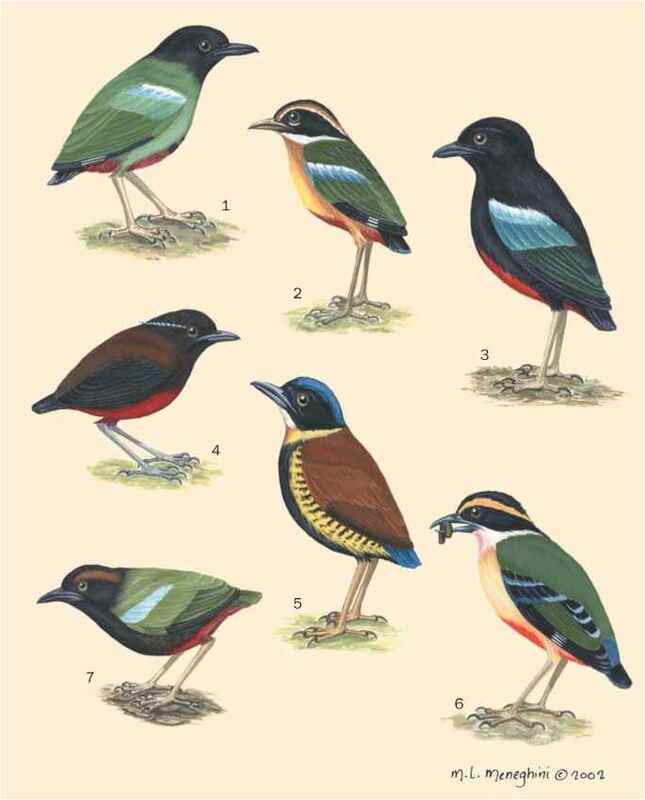 Elegant thrush-shaped bird with brown mantle, black mask, and yellow throat and underparts. Sexes monomorphic. Nominate subspecies, from the western part of the range, has an olive green nape and crown, while the two isolated eastern subspecies have brilliant dark blue napes and crowns instead. Jiangxi population has a clear, brilliant yellow chest, while birds from Yunan have yellowish gray chests. Western population in eastern India (the Manipur Valley, Nagaland, Assam, and Mizoram), the Chin Hills of Mynamar, and possibly Bangladesh. Isolated Chinese populations: one in Jiangxi Province, another in Yunnan, and perhaps another yet to be ascertained, from which captive specimens have arrived. Hunts through leaf-litter and other substrate for insects. Also consumes fruit. Captive birds produce clutches of two or three eggs, in smallish cup-shaped nests of twigs and plant fibers. Incubation, lasting 13 days, is performed by both parents. As with other Garrulax, while a flock may be present during nesting, only one pair actually breeds. Though previously listed as Near Threatened, IUCN designated it as globally non-threatened as of 2002. However, isolated Chinese populations, possibly constituting a separate species, appear to be very small and occupy limited ranges. Not listed by CITES. Commercial live bird exports banned by People's Republic of China in 2001.